The ill fated Lib Dems are widely reported to have turned a corner this afternoon following the announcement that fictional potato based cartoon character Mr Potato is to take over as leader. Though like Nicola Sturgeon, not actually an MP, the popular Euro-spud is widely predicted to shake the party up by doing some things and saying some stuff. The new leader promised a packed press conference he would inject new life into the depleted shadow of a former minor party. Party president Sal Brinton said: “Mr Potato is a fantastic communicator and his energy, enthusiasm and passion will inspire and drive the Liberal Democrats back to winning ways. Well not ‘back’ but you know what I mean. 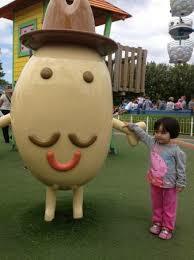 One Lib Dem member told us that the potato like statesman would be entering his new challenge with his eyes wide open.